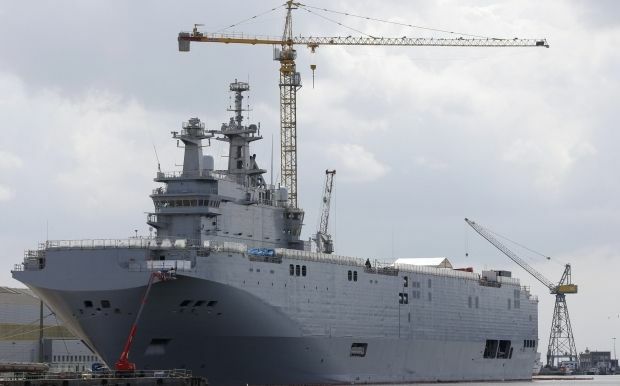 The final amount that France has paid Russia for termination of the contract for the supply of two French-built Mistral helicopter carrier assault ships is almost EUR 950 million, according to the official website of the French National Assembly. According to the documents submitted, the settlement agreement was signed by Russian Deputy Prime Minister Dmitry Rogozin and the Special Representative of France Louis Gauthier in Moscow on August 5, 2015. Pending receipt of all payments by Moscow, Paris is not allowed in any way to transfer the ships to a third party, the document says. Another paragraph states that no third party that could incur losses from the termination of the contract for the supply of Mistrals has the right to claim compensation. As UNIAN reported earlier, Russia was planning to ban potential future sale of Mistrals to potential customers if Russian Ka-52K attack helicopters were not bought along with the ships.